Please carefully read these General Terms and Conditions of Sale, General Terms and Conditions of Use and the Privacy and the Cookie Policies of the givenchy.com website. You can also print the full text of these General Terms and Conditions of Sale by clicking on the button below. Use of the remote sales process described in these General Terms and Conditions of Sale is restricted to consumers only, (i) as defined by law and case law, and (ii) acting exclusively on their own behalf. These General Terms and Conditions of Sale apply to all sales of GIVENCHY products concluded either through the Customer Service department implemented by GIVENCHY and contactable by telephone at 00 800 0000 1952 (toll-free number for any call made from Spain ) or via the Givenchy Customer Service postal service - 159, avenue Charles de Gaulle, 92521 Neuilly-Sur-Seine cedex, France (hereinafter “Customer Service”), or via the merchant site accessible from the Spanish version (available, for the convenience of the customer only, in four languages: French, English, Italian and simplified Chinese) of the givenchy.com/eur/fr site (hereinafter the “Site”), for delivery in Spain only, this term being understood as excluding Ceuta, Melilla, La Envia, Formentera and Canary islands. *In the case of telephone sales, any sale of GIVENCHY items via the Customer Service department implemented by GIVENCHY is concluded subject to the resolutory clause of these General Terms and Conditions of Sale, previously accepted by the customer via telephone. *In the case of electronic sales (Internet), the customer declares to have carefully read these General Terms and Conditions of Sale prior to the placement of the order and he/she will then be asked to confirm his/her acceptance of the General Terms and Conditions of Sale during each purchase on the Site by checking the box “I have read and I accept the General Terms and Conditions of Sale and Use, as well as the ‘ Privacy and Cookies Policies of the givenchy.com site.” The confirmation of his/her order therefore constitutes acceptance without restriction or reservation of these General Terms and Conditions of Sale. In accordance with the provisions of Article 1127-1 of the French Civil Code, these General Terms and Conditions of Sale may be saved by any person visiting the Site by means of a computer download and may be reproduced via printing. 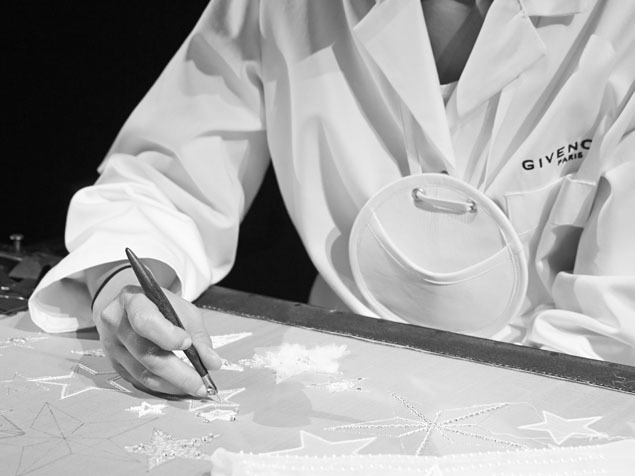 GIVENCHY reserves the right to make any changes to its General Terms and Conditions of Sale. However, orders will be governed by the General Terms and Conditions of Sale in force at the time when said orders were placed by the customer. In the event that, subsequent to the date of their removal from the fr.givenchy.com site, an outdated version of the General Terms and Conditions of Sale remains available to the public via other websites or by any other means other than on the www.givenchy.com site or through Customer Service, these Terms and Conditions would no longer, however, be binding on GIVENCHY for the orders placed after said removal. Orders will only be received in French and in English by GIVENCHY Customer Service at 00 800 0000 1952 (toll-free number for all calls made from Spain), Monday through Saturday from 10:00 am to 7:00 pm (Madrid time), except holidays, for delivery to “mainland Spain” (this term being understood as excluding Ceuta, Melilla, La Envia, Formentera and Canary Islands. The merchant Site accessible from the Site allows for the ordering of a selection of GIVENCHY products (hereinafter the “Product(s)”) immediately online via the Internet for delivery to “mainland Spain” (this term being understood as excluding Ceuta, Melilla, La Envia, Formentera and Canary Islands. Customers can obtain additional information by contacting Customer Service by telephone. Information relating to all GIVENCHY Products that may be sold on the Site or through Customer Service is available in all GIVENCHY stores and on the givenchy.com website. This information complies with the requirements of the legal and regulatory texts in force. Product visuals appearing on the Site may be altered according to the quality of the equipment used by the customer to access the Site. In this case, GIVENCHY may not be held responsible. It is stipulated that the customer may always exercise his/her right of withdrawal in accordance with Article 10 below. Our product offerings and prices are valid as long as they are visible on the Site, within the limit of available stock. Errors or modifications may exist in exceptional cases, particularly in the case of simultaneous orders of the same Product by several customers. In any event, and in the case of total or partial unavailability of products after placing an order, the customer will be informed by e-mail as soon as possible of the unavailability of the product and of the total or partial cancellation of the order. In the event of total cancellation of the order, GIVENCHY Customer Service will contact the customer to inform him/her of the cancellation of his/her order and proceed with a refund, which will take place as soon as possible within no later than 14 days. The customer will be shipped the available products. Customer Service will contact the customer to inform him/her of the unavailable products and proceed with a refund, which will take place as soon as possible, and no later than 14 days following shipment of the available products. GIVENCHY reserves the right, at any time and without prior notice, to change the Products offered on the Site. To ensure better quality of service and availability of our Products to all customers of the Site, GIVENCHY reserves the right to limit the quantity of Products a customer can purchase, in accordance with the applicable provisions and, in particular, with those of Article L121-11 of the French Consumer Code. At any time, the customer may add Products to his/her selection by clicking on “Add to cart,” and choose to complete his/her purchases or continue his/her browsing. After selecting the Product(s), click “Check Out” to begin the ordering process. If the customer already has a customer account, at this point he/she must identify himself/herself by entering his/her password. If the customer does not yet have an account, he/she will be invited to create one by entering his/her e-mail address and creating a password. For the Site's mobile version, he/she will be asked to enter this information during the identification process. Usernames and passwords are strictly personal, therefore the customer undertakes to keep them safe and to never communicate them to third parties. GIVENCHY shall, in no event, be held liable for any loss, theft or fraudulent use of the customer's account, in which case the latter undertakes to inform GIVENCHY immediately. - manage his/her subscriptions to the GIVENCHY newsletter. If the customer has a customer account, he/she may have his/her account deactivated at any time by sending an e-mail to Customer Service by clicking on the “Customer Service” link. After deactivating his/her account, the customer is free to create a new account at any time. The customer may also log in as a guest, without creating an account. Only a title, first name, last name and e-mail address, as well as the information necessary for the delivery of the order, are necessary to process the order. No customer account will be created and all customer details will need to be re-entered for future orders. The data recorded by the Site constitutes proof of all transactions between GIVENCHY and its customers. In the event of conflict between GIVENCHY and one of its customers over a transaction carried out on the Site, the data recorded by GIVENCHY is considered as valid proof of the content of the transaction. The customer must, on one hand, confirm his/her delivery method and, on the other hand, complete the delivery information necessary for the proper shipment of his/her order: title, first name, last name, telephone number, shipping address. Upon confirmation of the delivery method, the customer may, for a gift order, include an accompanying card. The customer may use his/her shipping address as the billing address or enter a different address. He/she will then be asked to select a payment method and to enter the information related to it, and must then verify the accuracy of his/her selection before confirming the order. Pursuant to the provisions of Article 1127-1 of the French Civil Code, the customer will have the option, before finalizing his/her order, to verify the details of his/her order and its total price and to correct any errors, before confirming the order to express his/her acceptance. At the end of the ordering process described above and after accepting the General Terms and Conditions of Sale and Use in their entirety, as well as the Privacy and Cookies Policies of the Site, the customer must click on the “Confirm your purchase” button. Any order entails an obligation to pay. For more information regarding payment terms (currency, accepted payment methods, etc. ), please refer to Article “6. Prices – Accepted payment methods” below. Once completed, the order is sent to GIVENCHY for processing. GIVENCHY reserves the right to not accept an order from a customer with whom it is in dispute over a previous order, or if GIVENCHY reasonably believes that the customer has breached these General Terms and Conditions or has engaged in a fraudulent activity, or for any other legitimate reason. A summary of the order acknowledging receipt of the order will then be sent by e-mail to the customer. Once the payment has been confirmed and duly completed, an order confirmation will then be sent indicating the total amount of the order, information related to delivery times, key features, and the quantity and price of the Products purchased. The customer is advised to keep the acknowledgment of receipt of the order and the e-mail confirmation of the order on paper or electronically. Pursuant to Article L213-1 of the French Consumer Code, when an order equals an amount equal to or greater than €120, GIVENCHY retains a written record of the contract concluded between GIVENCHY and a customer electronically for a period between the conclusion of the contract and the date of delivery of the goods, and for a period of ten years from the date of delivery (in accordance with Decree 2005-137 of February 16, 2005). The customer has access to this document at any time, upon request made to Customer Service by telephone at 00 800 0000 1952 (toll-free number for any call made from Spain), Monday through Saturday from 9:00 am to 8:00 pm (Madrid time), except holidays, or by e-mail by clicking on the “Customer Service” link and providing a form of identity. The prices of Products are indicated in Euros, all taxes included. GIVENCHY does not offer a VAT refund service for purchases that might be eligible for a tax refund. GIVENCHY reserves the right, at any time and without prior notice, to change the prices of the Products offered on the Site. Products are charged on the basis of the prices displayed on the Site at the time of placing the order, subject to the availability of the Products ordered at that time. All orders are payable in Euros and must be paid immediately upon placing your order. In the event of unavailability of certain Products ordered, the regulations described in Article 4 “Product Information and Availability” will apply. For orders on the Site: The customer must guarantee that he/she is the holder of the card used for payment. Credit card payments are authenticated and secured using the 3D Secure system. This device is also known as “Verified by Visa®”,”MasterCard® SecureCode,” or “American Express SafeKey®.” During payment, the bank will request personal information from the customer in order to verify the identity of the cardholder and to validate the transaction. - the customer's date of birth, etc. Once the 3D Secure code is entered and validated by the customer's bank, the order is finalized and the customer receives a message acknowledging receipt of his/her order. As authentication is specific to each bank, the customer is invited to contact his/her bank directly for any questions on the subject. Confirmation and shipment of your order take place only after verification of the payment method and receipt of the authorization to debit the customer's card. Debiting of the customer's account will take place at the time of the validation of the order by the bank and therefore prior to the shipment of the order. In any event, if for any reason the debiting of amounts owed by the customer proves to be impossible, the sale carried out by telephone will be immediately resolved and the processing of the purchase on the Site canceled. The provisions of Article 1341 of the French Civil Code do not apply to sales concluded by GIVENCHY remotely. The information in connection with the order is subject to automated data processing, for which CYBERSOURCE is responsible. The purpose of this automated data processing is to determine a transaction's analysis level and to combat credit card fraud. CYBERSOURCE and GIVENCHY are the recipients of the data relating to the customer's order. The non-transmission of the data relating to the order prevents the completion and analysis of the transaction. If there is an outstanding debt due to the fraudulent use of a bank card, the contact information in relation to the order associated with this unpaid amount shall be recorded in a payment incident file implemented by CYBERSOURCE. An irregular declaration or an anomaly may also be subject to specific processing. In accordance with Data Protection Act, no. 78-17 of January 6, 1978, as amended by law no. 2004-801 of August 6, 2004, the customer has, at any time, the right to access, rectify, and oppose all his/her personal data by writing, via mail and with proof of identity, to GIVENCHY - Customer Service - 159, avenue Charles de Gaulle, 92521 Neuilly-Sur-Seine cedex, France. The Products ordered remain the full and whole property of GIVENCHY until complete payment of the amount to GIVENCHY in principal, with fees, taxes and compulsory contributions included. However, the customer assumes the risks (including loss, theft, or deterioration) associated with the Products delivered from the moment they are delivered to the address indicated at the time of the order. 8.1. Delivery The Products purchased on the Site or by telephone through Customer Service can only be delivered to “mainland Spain” (this term being understood as excluding Ceuta, Melilla, La Envia, Formentera and Canary Islands. It is not possible to place an order for any shipping address located outside this Delivery Zone. For security reasons, GIVENCHY will not process any order for which a post office, P.O. box, hotel, business address, university campus address or Cedex address is provided. Products are shipped to the shipping address indicated by the customer during the ordering process. Delivery of the Products ordered on the Site or by telephone through Customer Service is offered free of charge by GIVENCHY, whatever the order amount or delivery method chosen by the Customer. The order will be delivered, by express delivery, within an indicative period of 2 working days (all days of the week except Saturdays, Sundays, and holidays). Deliveries will be carried out against signature. Delivery time frames will begin from the shipment of the order by our Customer Service department, made known by the order shipment notice sent by e-mail to the customer. In accordance with the French Consumer Code, delivery of the products ordered will take place within the delivery times communicated by GIVENCHY, and in the absence of any indication, at the latest within 30 days from the order, subject to the full payment of the price. At the beginning of the ordering process, GIVENCHY specifies the forms of delivery available for the Products purchased. If, upon delivery, the external packaging is not in perfect condition, the customer is requested (i) either to open the package in the presence of the carrier in order to verify the condition of the Product(s), or (ii) to refuse delivery and contact Customer Service at 00 800 0000 1952 (toll-free number for any call made from Spain, Monday through Saturday from 9:00 am to 8:00 pm, except holidays. The customer has a period of 12 months from the date of the Product's delivery to request the sending of a receipt via postal service by contacting Customer Service by telephone at 00 800 0000 1952 (toll-free number for any call made from Spain, Monday through Saturday from 10:00 am to 9:00 pm (Madrid time), except holidays, or by e-mail by clicking on the “Contact” link in the Customer Service section and providing proof of identity. The Customer has a legal right of withdrawal which he/she can exercise under the conditions provided for by Articles L221-18 and L221-20 of the French Consumer Code, if he/she meets the conditions laid down by these provisions, without having to justify reasons and without having to pay penalties. To ensure the satisfaction of its buyers and recipients of orders, GIVENCHY allows its customers to withdraw within thirty (30) days from the date of delivery of the Products, without having to justify reasons and without having to pay penalties. After this period, the customer may no longer exercise his/her right of withdrawal. If it is an order for several Products ordered and if the Products are delivered separately, the starting point of this period will be when the customer comes into possession of the last Product delivered. GIVENCHY offers its customers the option to fill out and submit their withdrawal statement online by logging on to their customer account or by contacting Customer Service. The Customer will then receive confirmation of his/her withdrawal by e-mail. In accordance with Article L. 221-28 of the French Consumer Code, the right of withdrawal may not be exercised, in particular, for orders relating to the supply of goods that have been unsealed by the consumer and that cannot be returned for hygiene and health protection reasons. Within the framework of the right of withdrawal or in the event of nonconformity of the Product, the customer may return the purchased Product(s) and request a refund under the conditions described in Article 11 below. To return the Products received, the customer benefit from a Product collection service at the location of his/her choice in Spain, being understood as excluding Ceuta, Melilla, La Envia, Formentera and Canary Islands. In all cases, the customer must return the delivered Products in their original packaging; they must be complete (with boxes, accessories, covers, booklets, etc.) and accompanied by the return voucher and/or return number. Products returned incomplete, damaged, deteriorated, soiled or in any other condition that would reasonably lead to the conclusion that they have been used or worn will not be refunded or exchanged and will be returned to the customer. It is stipulated that for orders delivered to third parties who are recipients of gifts ordered by a customer, from the Site or by telephone through Customer Service, only the customer who bought the gift may request the refund within the framework of the right of withdrawal (to the extent that only the bank account of the person who ordered the product may be re-credited). The customer must contact the Customer Service Department (159, avenue Charles de Gaulle, 92521 Neuilly-Sur-Seine cedex, France by telephone at 00 800 0000 1952 (toll-free number for any call made from Spain) as soon as possible and, in any case, within a period allowing for the return of the Product concerned of fourteen (14) days from the notification of the exercise of his/her right of withdrawal, in order to set an appointment (date and time slot) for the collection of said Product by GIVENCHY. If the Products can be subject to the legal right of withdrawal, the buyer, exercising his/her right of withdrawal under the conditions stipulated in Article 10.1 in terms of the period and terms of returning the Products, may obtain a refund for the Products returned. The returned Product(s) will be examined in advance by the GIVENCHY quality department. The customer will be notified of the refund, or the reasons for non-refund, and the terms of returning the Product(s) by Customer Service within 14 days from the date on which it is informed of the decision of the customer to withdraw; this reimbursement may be deferred up to 14 days after receipt of the Products by GIVENCHY. The refund of the amounts paid for the returned Products will be made, depending on the method through which the Products were paid for, by credit to the bank account corresponding to the bank card used for payment. Please note, however, that your bank may have specific processing times when it comes to carrying out a refund on your card, depending on processing times. This varies among card issuers, and we are not in a position to accelerate this process, which is beyond our control. No exchange of Products purchased electronically or by telephone will be made by GIVENCHY subject to statutory rights. GIVENCHY will deliver a Product compliant with the contract and free from nonconformity upon delivery of said Product, in the sense that the Product will be fit for the purpose generally expected of a similar product and that it will present the characteristics shown at the time of sale. GIVENCHY is also liable for any nonconformity that results from the packaging, assembly instructions or installation, if it was responsible for installation pursuant to the contract or it was carried out under its responsibility. This warranty will only be effective if the customer requests it within a period of two years from the date of delivery of the Product. The customer is exempted from providing proof of the nonconformity of the goods during the 24 months following the delivery of the Product. The customer may choose between a repair or replacement of the Product unless one of these choices results in a cost that is disproportionately high for GIVENCHY. If a repair or replacement of the Product is not possible, the customer may have the price paid refunded and return the Product, or keep the Product and be refunded a portion of the price, unless the lack of conformity is minor. The return, replacement or reimbursement of the Product shall be carried out at no cost to the customer and shall not prevent any awarding of damages in the event that the customer may be entitled thereto. The legal warranty of conformity applies irrespectively of the commercial warranty indicated in Article 12.2 below. GIVENCHY will deliver a Product free of latent defects that would render it unfit for the use for which it is intended, or that would diminish this use to such an extent that the buyer would not have purchased the item, or would have purchased it at a lesser price, if he/she had been aware of them. This warranty will only be effective if the customer requests it within a period of two (2) years from the date of discovery of the defect. In the event of latent defect, the customer has the choice of returning the Product and being refunded the price and expenses incurred in connection with the sale, or of keeping the Product and being refunded a portion of the price. In all cases, it will be the customer’s responsibility to prove that it meets the conditions of the warranty. "When the buyer requests that the seller, within the course of the commercial warranty granted to it during the acquisition or repair of personal property, carry out a repair as covered under the warranty, any resulting periods of at least seven days in which the good is out of service will be added to the duration of the remaining warranty. For any information, claim, or question relating to these General Terms and Conditions of Sale or to the Products themselves, the customer should contact GIVENCHY Customer Service (159, avenue Charles de Gaulle, 92521 Neuilly-Sur-Seine cedex, France) by telephone: 00 800 0000 1952 (toll-free number for any call made from Spain, or on the Site via the available form in the Customer Service “Contact” section, providing his/her order number if necessary. As part of the management and follow-up of orders placed through Customer Service or the Site, GIVENCHY collects and processes the personal data relating to its customers. This information, intended for persons authorized by their position to have knowledge of it within GIVENCHY and, where appropriate, for authorized third parties, is necessary for the processing and following-up of customer requests or orders, in order to better respond to their expectations and for the prevention of any fraudulent use of their means of payment or identity. The performance by GIVENCHY of all or part of its obligations will be suspended in the event of a fortuitous event or a case of force majeure under Article 1218 of the French Civil Code, which would hamper or delay its performance. GIVENCHY will inform the customer of such a fortuitous event or case of force majeure within seven (7) days of its occurrence. Should this suspension continue beyond a period of fifteen (15) days, the customer would then have the option to cancel the order in progress and he/she would then be refunded at the latest within 14 days from said cancellation. In no event shall GIVENCHY be liable for any damages that are not a result of GIVENCHY failing to fulfill one of its obligations. For the convenience of customers, the Site and the General Terms and Conditions of Sale are available in four languages: French, English, Italian, and Chinese. However, in the event of a contradiction between the French version and another language version, the French version shall prevail. - GIVENCHY may refer the case to the court of the domicile of the customer. (Please complete and return this form only if you wish to withdraw from the contract). [*] Cross out as appropriate.